The idea of building a large statue atop Corcovado was first suggested in the mid-1850s, but Brazil became a republic and, with the official separation of state and church, the idea was dismissed. The second proposal for a landmark statue was made in 1920, by the Catholic Circle of Rio motivated by the ‘Godlessness’ of the society at the time. The design represented a confluence of the Christian cross, a statue of Jesus with a globe in his hands, and a pedestal symbolizing the world. After considerable designs, the monument was opened on October 12, 1931. In the opening lighting ceremony, a battery of floodlights switched on remotely by shortwave radio pioneer Guglielmo Marconi, stationed 5,700 miles away in Rome, as if the Vatican blessed the work. There are many different images of the ever-present Cristo Redentor. It is regarded as a savior, a reminder to follow God’s will, and a sad figure watching over the carnage below. 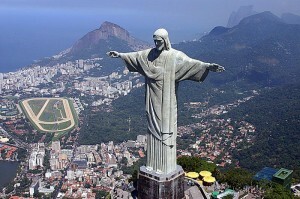 Christ Redeemer is the link between heaven and the hell below. The statue was struck by lightning during a violent thunderstorm on February 10, 2008, and suffered some damage to the fingers, head and eyebrows. 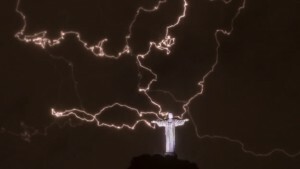 A restoration effort was put in place by the Rio de Janeiro state government to replace some of the outer soapstone layers and repair the lightning rods installed on the statue. People’s lives crash together with irreversible consequences of love and tragedy. 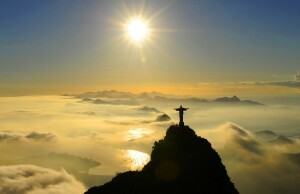 All the while, Christ the Redeemer watches with his omnipotence and omniscience from above. Sometimes good people do bad things for the greater good. Download the first 6 chapters of my Lucas Rocha Thriller Series pre-release! CLICK HERE.